Are you struggling to use your iPhone and Ipad with iOS 11? If, yes, then I have good news for you. Apple has just released an iOS update is known as iOS 11.3 to fix most of the bugs in iOS. It has not only set the bugs but also introduced the four new Animojis. 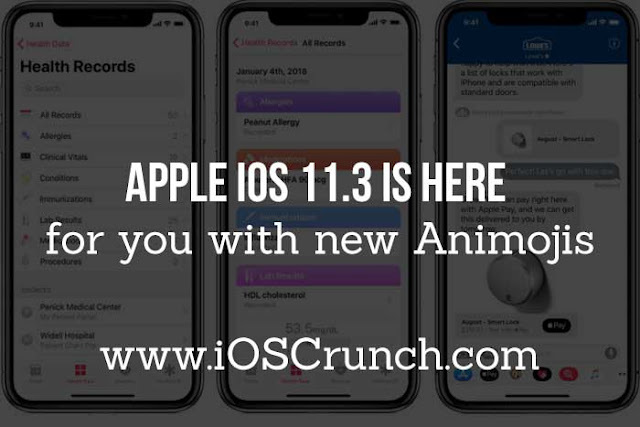 What's all new is coming with iOS 11.3? iOS 11.3 also coming with most awaited battery update. The new information tells you about the status of your battery such as capacity and time to charge. Health app is a new addition to iOS 11.3 update. It helps you keep track of health records. Health records are only available in the USA. What I like most about this update is that now you will find customer support messages in your message box. You can quickly talk about the business for your needs. You will also find video clip section now. You can also check the size of updates and many other things. Remember: To be on safe side always update your iOS device. Take the backup of all the data using iTunes before installing an update. In short iOS 11.3 is bringing a lot of minor and tiny updates altogether. If you still have any question, feel free to ask ioscrunch. Don't forget to share if you have already updated your iOS device or not?